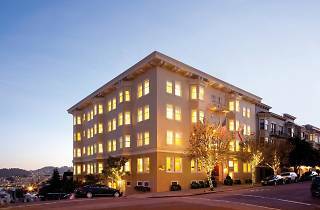 The Hotel Drisco is a sophisticated and welcoming boutique hotel situated in the posh Pacific Heights neighborhood with luxury amenities like nightly wine receptions and weekday chauffeur service. 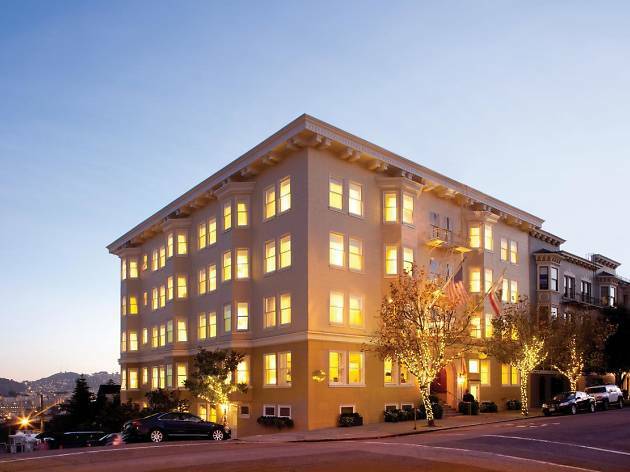 Housed in a historic turn-of-the-century Edwardian, the hotel is decked out in neutral colors and soft textiles. Guests can take advantage of complimentary continental breakfasts, nightly wine receptions featuring local artisanal cheeses and charcuterie, chauffeur services on weekday mornings and bath products by Bvlgari at this posh getaway. In the impeccably made-up rooms you’ll find warm and comfy down comforters and pillows, merino wool throws, Egyptian cotton triple sheeting and unmatched views of the San Francisco Bay Area. Pac Heights is a pristine and classic SF neighborhood filled with colorful Victorians (check out the Mrs. Doubtfire house! ), mansions and plenty of shopping opportunities including locally owned shops and international high-end brands. Time Out tip: The complimentary evening wine reception is not to be missed. There are local California wines, artisanal cheeses and charcuterie, fresh fruit and hot hors d’oeuvres, including delicious meatballs that could definitely spoil dinner.